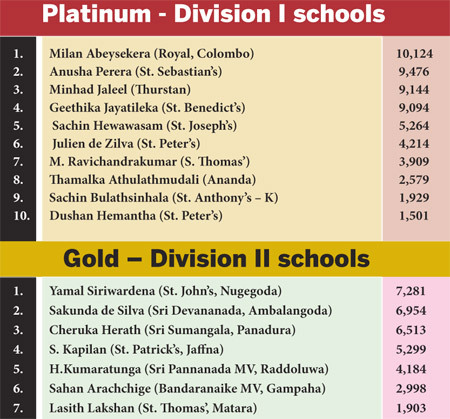 Minhad Jaleel of Thurstan College occupied the third position polling 9,144 votes after being fourth last week and Sebastinite Anusha Perera also moved one step up to second place after being third last week with 9,476 votes in the ‘Platinum’ contest. 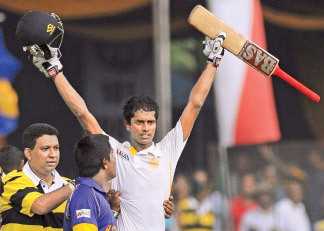 St. John’s, Nugegoda’s Yamal Siriwardena, (7,281) Sri Devananda Ambalangoda’s Sakunda de Silva (6,954) and Cheruka Herath of Sri Sumnagala, Panadura (6,513) maintained their first three positions in the ‘Gold’ competition for Division II schools. 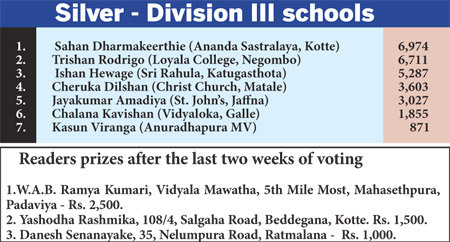 While there were no changes in the ‘Silver’ competition for Division III schools, Kasun Viranga Wickremasinghe from Anuradhapura MV made his presence felt by entering the Silver Segment polling 871 votes.